Cardiovascular magnetic resonance (CMR) can provide a wealth of diagnostic information in the assessment of hypertensive heart disease (HHD) that is complementary to echocardiography. CMR assessment of left ventricular wall thickness, volumes and function is both highly accurate and reproducible and can be used to describe the pattern of ventricular remodelling in HHD. Using CMR it is possible to detect and quantify the extent of myocardial fibrosis by late gadolinium enhancement (LGE), which may inform individualized risk stratification and influence treatment strategy. T1 mapping techniques offer additional insights into the cellular and extracellular compartments, and the combined assessment of both LGE pattern and T1 mapping findings can help in the differentiation of HHD from other conditions presenting with left ventricular hypertrophy. 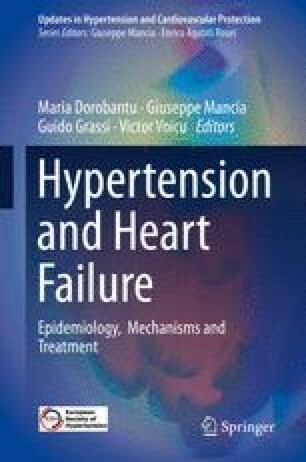 In this chapter we discuss the additive information that CMR can provide in clinical setting as well as its contribution to determining pathophysiological mechanisms in HHD.